I have this one waiting. It sounds fascinatingly unusual. I think I will read it soon. It’s very unusual. It shouldn’t work, but it does. There is a thread of conventional story, and lashings of opinionated elaboration as one follows that thread through to a rather satisfying conclusion. Fantastic for period “colour”, too. I started reading being very consciously neutral, because I’d heard the book was viewed as being a little bit suspect regarding the author’s intentions – was she in favour of dodging one’s country’s more inconvenient wartime demands or not? – but I came to the end feeling that the worst of the Roundelays’ selfish moanings were merely meant to be a reflection of the secret thoughts which so many doubtless harboured at the time. 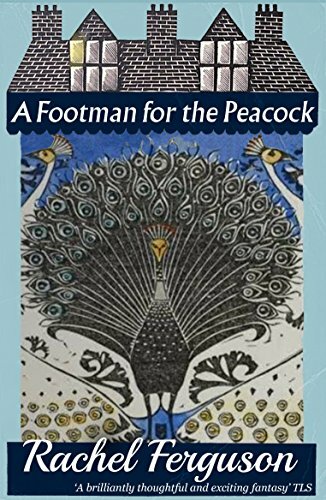 And the story aspect of the novel – the actual plot concerning the peacock, Sue and Angela – it is something quite separate from the wartime setting. There are parallel themes happening here, and they twine and intertwine and come out at the end making perfect sense. Not sure I’m ready to dive into Rachel Ferguson, yet–one can only take so many British war-time stories with artfully glib breakfast conversation (and I’ve been slogging through a few)–but your review was excellent! I can see this would be a difficult book to give a coherent overview of; well done. It’s wonderful that books like this are being re-printed for a wider audience. I found that this novel, as well as the one other by Rachel Ferguson I read a few years ago, did indeed take a lot of concentration, at least initially. She throws a lot at the reader right off the start, and the pace doesn’t slow down for a second. I am glad to have persisted, and her books are very much worthy of re-reading, and I’m keen to explore more of her work, but I don’t think one could read two of her novels back to back – exhausting! There do indeed seem to be an awful lot of cleverly witty wartime novels from this era floaing around – and quite logically so! – but you’re right; a change of pace is often needed in order to be able to revisit the genre and appreciate each writer’s “take” as it should be. I am so thrilled at the many reprints being undertaken recently – hurray the recent Margery Sharp releases! – so many truly entertaining novels which were getting impossible to find are now within our grasp. My biggest regret with these is the ebook format of so many – but Dean Street Press for one offers paper copies, too, so perhaps that will become an option with other publishers as well. The print-on-demand format, when carefully done, is a marvelous way to get these lost books back on the physical shelf. Thanks, I had no idea this book existed although I enjoyed The Brontes Went to Woolworths some years ago. So delighted that you enjoyed this, and thank you for the shout-out and kind words! The pleasure is all mine, Scott. Thank you.